We often tend to ignore dental care until we begin to face some problems like toothaches, gum swelling, and decay. It is only then that we realize that our teeth are as equally important as other body organs, and we do need to take proper care of them in order to keep teeth problems at bay. Here are few basic habits that you need to avoid in order to keep your teeth healthy and damage-free. Grinding your teeth is usually a result of stress and sleeping habits. Teeth grinding leads to teeth wearing that makes them vulnerable to fall and wreckage. To protect your teeth, avoid grinding by avoiding eating hard foods. Wear a mouth guard during sleeping so that you do not damage your teeth by sleep grinding. Chewing on ice can lead to the chipping or cropping of your teeth and can damage your teeth enamel as well. And if munching on those frozen ice cubes affects the soft tissues inside your teeth, then toothaches may follow. So instead of chewing the ice cubes the next time you feel the urge to do so, make sure you indulge in anything else that may be a substitute for your craving. Candies and chocolates not only satisfy your taste buds but their sugary content also sticks to your teeth enamel, resulting in decay and damage. Make sure you brush your teeth after eating any such sweet food items. You may also choose to have these before meals in order to avoid the settling of these sugary treats on your teeth. Candy and Chocolates are the major causes of tooth decay. If you find any signs of caries in your teeth check our Healthy Smile Package. Did you know that each serving of soda can have up to 11 teaspoons of sugar? To add to this, sodas also contain citric and phosphoric acids that are harmful for your enamel. And if you think diet drinks can keep you away from tooth problems, think again! These are even more harmful since they have more acids in the forms of artificial sweeteners. We often open sachets, plastic packets, bottle caps etc using our teeth. These habits tend to cause the cracking or chipping off of the teeth, which in turn cause pain and other tooth problems. Remember to use your teeth only for eating, and not as a substitute for scissors and openers. The bacteria in plaque break down the starch in the food into acid, which attacks your teeth for about 20 minutes, and even more if the food remains stuck between your teeth. To stop the decaying at base, take care to floss after eating such chips or starchy food items that often get stuck in your teeth. Drinking coffee causes yellowing of your teeth over a period of time. However, various whitening methods are now easily available in order to get rid of such stains caused by drinking a lot of coffee. 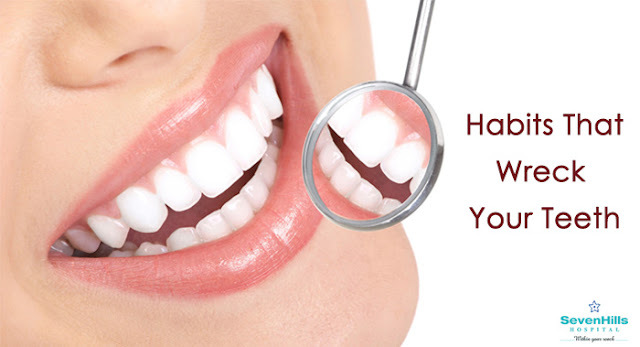 Your dentist can help you to treat the discoloration of your teeth, if that is a concern you would like to address. Just like coffee, cigarettes and other tobacco products too stain your teeth and tend to fall out due to gum diseases. Tobacco also leads to cancer of the tongue, mouth, and lips. Quit tobacco to live a healthy life and to have healthy teeth. Wines weaken the enamel and leave your teeth porous and vulnerable. This causes rough spots, staining, and weakening of your teeth. As a result, your teeth tend to become brittle over time, and gums loosen, causing the teeth to fall. Swish your mouth with water to avoid the after effects of drinking wines.